The Union Congregational Church began with the formation in August 1899 of a congregation known as the Union Church Society. 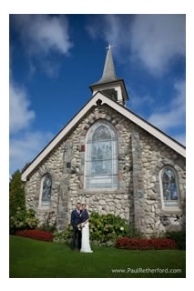 The church structure was built of local fieldstone in 1904 with Deacons S.B. 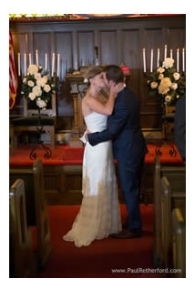 Poole and J.M. Leggett setting the cornerstones of the church. Asbury W. Buckley of Chicago was the architect and the Koepke Brothers of Petoskey were hired as contractors. Local builder Frank Rounds and his crew gathered glacial-erratic fieldstones to construct the church. The granite cut stones used for the buttresses and courses surrounding windows and the door must have been transported as they are not indigenous to the Island. 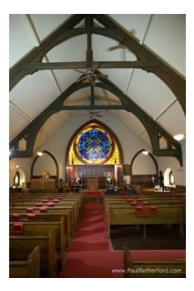 The 55 by 40 foot interior, featuring gleaming woodwork, and deep-set, colorful memorial windows is virtually unchanged. 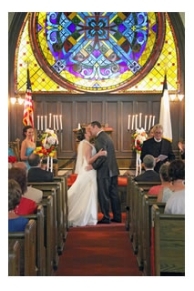 More recently, a rose window was added above the altar. During its early years, the church was served by Presbyterian, Methodist and Congregational ministers. Its formal name reflects the ecumenical spirit of the founders and their leaders. 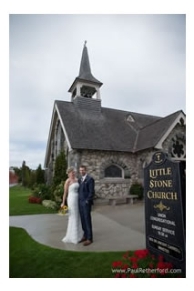 A few years after it was constructed, the name "Little Stone Church" came into common usage. As member Lorabeth Fitzgerald commented, "This name seems to reflect the affection that members and visitors alike hold for this little church." 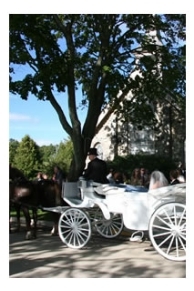 The three church windows below represent scenes in the history of Mackinac Island. The three windows were dedicated to Gurdon Saltonstall Hubbard of Chicago, who spent ten years on the Island during the 1800s. 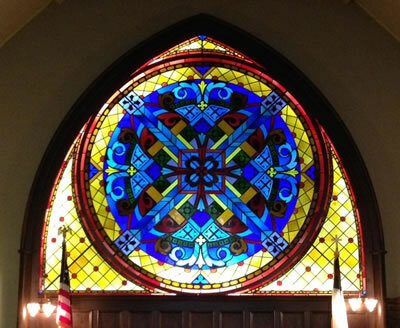 Installed in 1914, all fourteen windows of the church were made by the Lamb Studios, founded in 1857 and now the oldest continuously operating stained glass studio in the United States. Robert Stuart, John Jacob Astor's agent for the American Fur Trading Company, negotiating with voyageurs. Stuart, in the blue coat, points to a scroll that may be an account of their business dealings. 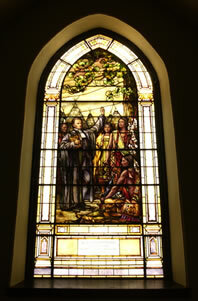 This window features Presbyterian missionary William Ferry. Ferry, sponsored by the United Foreign Mission Society of New York, established a school for Indian children in the Island's Mission House in 1825. 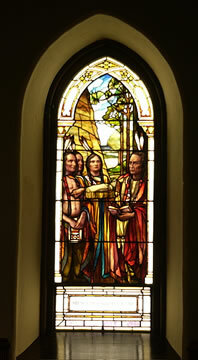 This window represents Shusco, a Native American converted to Christianity by Reverend Ferry, reading his Bible to his fellow tribesmen. 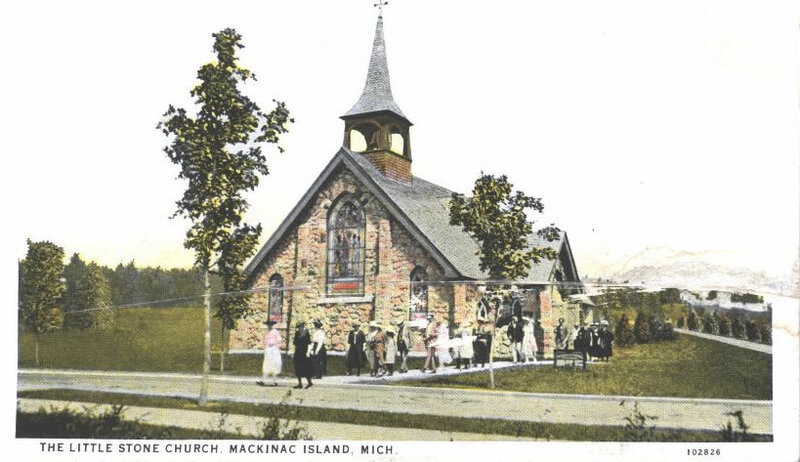 The Little Stone Church, a registered Michigan Historic Site, celebrated the centennial of its founding congregation in 1999. 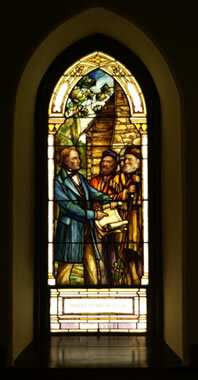 The church was registered in the Michigan Stained Glass Census by Lorabeth Fitzgerald of Grand Ledge (MSGC 94.0148).